Last week was one of those that highlighted the divergent news agendas of the mainstream and online media. While two stories—unrest in the Middle East and President Obama’s State of the Union address—dominated coverage in the traditional press, bloggers and Twitter users opted for very different topics. In the blogosphere, the No. 1 linked-to story from January 24-28 was Supreme Court Justice Clarence Thomas’ failure to report his wife’s earnings over a five-year period, according to the New Media Index from the Pew Research Center’s Project for Excellence in Journalism. Drawing 14% of the links, bloggers were highly critical of Thomas, accusing him of a double standard after the watchdog group Common Cause charged that he had failed to report his wife’s earnings of $680,000 from the conservative Heritage Foundation. Even though Thomas later admitted the error and amended his financial statements, critics took joy in needling the controversial judge. Another major story, with 11% of the links, involved U.S. economics. Most of the attention focused on a Washington Post report claiming Obama was unlikely to support his deficit commission’s controversial proposals regarding Social Security—such as raising the retirement age or reducing the program’s benefits. Bloggers gave more of a mixed verdict here. Many supported Obama’s view for both political and policy reasons. Others, however, criticized Obama for being unwilling to take important steps to secure the country’s economic future. Also at 11% was a Los Angeles Times story about two teenagers found dead in an apartment alongside an empty can of the caffeinated alcohol drink known as Four Loko, which has been banned in some states. Although it was not immediately clear if the drink was the cause of the deaths, concerns about its safety were enough to raise questions about the role it may have played. At No. 4, with 10%, was a BBC story about a polar bear that swam for more than nine days in search of sea ice. Scientists from the U.S. Geological Survey suggested that this journey provided more evidence of global climate change. The fifth story (at 9%), was another BBC report, this one about the firing of British sports announcer Andy Gray due to allegations of sexist and improper behavior. 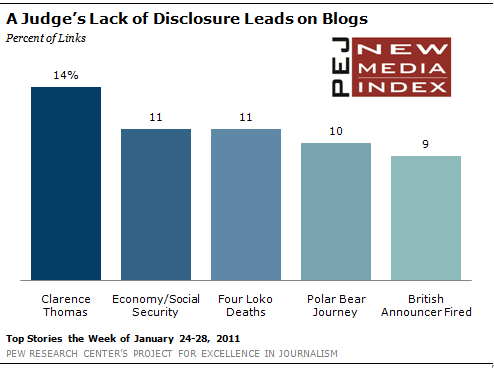 The turmoil in Egypt did not register as a major social media topic in the sample studied by PEJ last week. It did, however, rank as the seventh-biggest story among users of Twitter, a platform that has been extensively used to share information about such events as the 2009 protests in Iran and the devastating earthquake in Haiti. Despite attempts by the Egyptian government to block access to Twitter within their country, users posted images, links, and other pieces of information about the uprising from the outside. In the blogosphere, interest in the situation in Egypt seemed to pick up by the weekend, a period not included in this report. Other stories linked-to on Twitter last week involved the web and technology, including disagreement over the value of news and information online. The No. 1 story (14% of the news links) was a TechCrunch piece by Paul Carr defending AOL against criticism in a recent New Yorker story that the company relies too heavily on technology and not enough on journalists, resulting in poor news quality and selection. Carr wrote that AOL’s news judgment is no different than other major internet news sources because most consumers want dumbed-down content about salacious subjects. 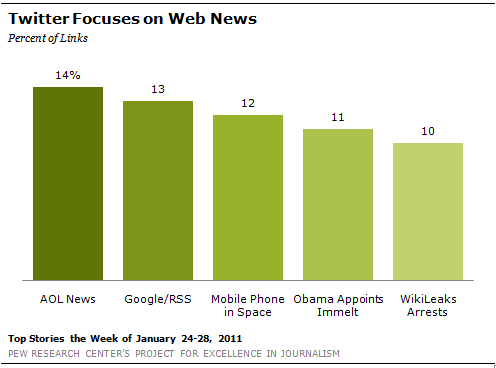 The second-largest subject (at 13%) was a follow-up to a story that was popular the previous week. On January 21, Google announced that the removal of the RSS reader option from Gmail was a mistake. That came after users voiced their displeasure with the action, and Google’s subsequent response proved to be another example of the impact that an explosion of opinion online can have on a major company. At No. 3 (12%) was news that a team of British engineers are planning to send a mobile phone into space to see if today’s products are able to function in such an environment. A TechCrunch report about Obama’s decision to appoint General Electric’s chief executive, Jeff Immelt, as chairman of his panel of economic advisors was the fourth subject at 11%. The author, Lora Kolodny, wondered if Immelt’s support for carbon cap-and-trade was a positive sign for proponents of green technology. And the arrest of five men between the ages of 15 and 26 for launching web attacks in support of WikiLeaks against companies such as PayPal, Mastercard and Amazon was fifth at 10%. News that Clarence Thomas had failed to include more than half a million dollars of his wife’s income on financial disclosure statements brought charges of hypocrisy. Some wondered if this error was intentional. And a few bloggers used the opportunity to criticize the conservative Thomas, with references to his highly charged confirmation hearings. A passionate online discussion was sparked by a Washington Post article—leading up to Obama’s January 25 State of the Union address—predicting that Obama would not endorse his deficit commission’s recommendations to either raise the retirement age or reduce Social Security benefits. Some bloggers applauded Obama’s reported reluctance to alter the program because it was good policy. Others supported it for political reasons. Critics, however, argued that Obama was ignoring economic realities and afraid to make tough choices. The most viewed news clip on YouTube last week was the most recent episode of the first-person YouTube series The Philip Defranco show. The weblogs, known for their jump cuts and close-up view of its host, consist of Defranco’s take on current events including politics and pop culture. The second most viewed video was a segment from the June 9, 2010, edition of Glenn Beck’s Fox News Channel show. The 22-second clip includes Beck’s discussion of radicals when he says, “They believe and have called for a revolution. You’re going to have to shoot them in the head. But warning, they may shoot you." Beck and his supporters claim that the clip has been taken out of context and that he was warning against radical leftists who have called for a violent revolution.